Shapes are what we normally would use to define certain things (mainly physical) and what they can be used for. Shape can also represent certain aspect or feel when we see them. The basis of drawing anything start from the basic shape of what we want to draw. When deciding how a character should look like, or what a particular character’s role in the storyline, it is best that you know which shape to use to start with. Remember how different colors can bring out or represent different emotion or feeling? Remember how red is associated with fire, anger, strength and green could represents nature, calmness, or agility? The same approach or perception is actually used for shapes. A simple shape can tell many things. A lot of people see different shapes and may have different perspective on what they see them for or what a particular shape represent. Simple shapes are often associated with aspects or feature that is relatable. As far as shape goes, there are many; rectangles, cylinders, ovals, but lets start with the basic three: square, circle, and triangle. – Squares are usually associated with terms like strength, order, security, honesty, or stability. – Square are used often when creating a strong facial structure, especially for men. -Circles are commonly associated with unity, fullness, protection, childish, comfort, or wisdom. -Triangles are related to term like aggressive, offense, power, determination, balanced, versatility or conflict. Whenever you want to create a design of a character from scratch, it is almost natural for you to combine shapes to make them fit the character you are creating. When combining shapes, instead of just the design, you are also putting together the term or definition that is relevant to both the shapes that are being used. For example: Below is a picture of a shield or more accurately; a round shield. Most would use it for protection or blocking an attack rather than as a weapon. This is because of the circle shape of the shield and is relevant to the term it is associated. In the case of a circle, it can be something like completeness or protection. Now, take into account that the shield being a circle is in one shape and is not combined with anything else. Next is a shield that is also known as an assault shield.Instead of using a circle as a basic shape for the shield, we used the square as the main shape of the assault shield, which is also a good shape to be used for a shield as it is related to strength, security and stability. But unlike the round shield, we have decided to combine the existing square shape of the shield with an additional shape. In this case, a couple of sharp triangle shapes being put in at the bottom and the side of the shield.This adds more character to the shield and shows that despite the shield being used as a defensive object it can also be used in a more aggressive manner. The combination results in the assault shield being usable for both defending as well as attacking; thanks to the additional sharp triangle shape that represents the more offensive aspect of the shield.The combination of shapes can also be used for things like armor designs, weapons, architectural designs, body shapes and even facial structure. When you incorporate everything there is on a character (from the look of the character to the armor or costume design) with combination of basic shapes, you will notice the affect or the representation of the shapes that you chose will start to grow on what you have done so far.Lets take a look at another example. 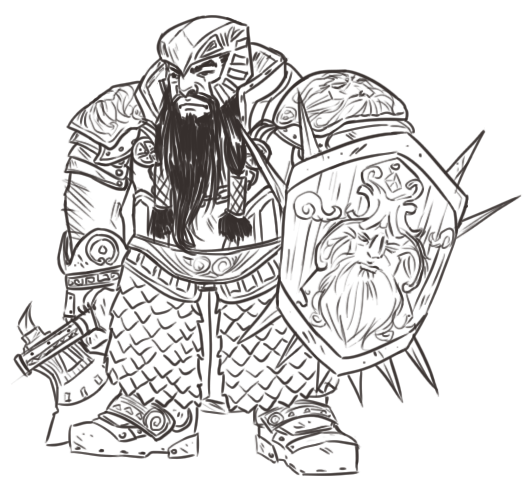 Below is an example of a dwarven warrior. Dwarven warriors are known to be tough and have very strong defense.If you look to the details of the armor of the dwarf below, you will notice the combination of squares (or rectangles) and circles are being used for it in a consistent manner. From the helmet, the body armor, all the way to the boots, the shapes used help brings out a strong sense of defense or protection to the armor and makes it look more solid and durable. This is because the armor combines elements or terms from the shapes involved which adds more definition or value to the armor. In the end, this gives the impression to an opponent that the dwarf is well armored and is going to be very hard to take down. The shape combination method is used as a basis for figure proportion drawing and can also serve as a starting point for almost everything you would like to draw, from vehicles, animals and also for body parts. To bring out the best of your character designs, always refer to your character development worksheet.As long as you know how to explain your character based of the worksheet, will know which shape is right for the character.Remember to be versatile and creative in combining the shapes to make the design more interesting or appealing and practical.Best approach for this is by using silhouettes. A silhouette is a black-filled outline of the character and is very similar to that of a shadow. Recognizability is the main reason why silhouettes are important in character designs. If you design a character with combination of shapes and make it recognizable just by its silhouettes, then you are on the right track. Here are some well known silhouettes. See if you can identify these characters. Notice how a strong silhouette can help you recognize a character almost immediately without any details.That is why, choosing the right shape or combination of shapes it pretty important as it influences the character design as well as the silhouette.The silhouette also gives an unique recognition to a character, even if it is mostly in black. A silhouette is also great for starting out a character design.The reason to this is that, with a silhouette you do not need to emphasize on the details of the designs.Instead, roughly sketch out (using white lines if black silhouette ) the design on the silhouette. Because a silhouette is fairly easy to create, you can make multiple sketch based on a single silhouette to encourage different approach or style on the design of the character’s costume or armor. This is great especially if you have several ideas or design for a single character or model. At this stage, just remember not to spend too much time on a single design because the purpose of using a silhouette for designing is for quick-sketching ideas you have for a design and to find the shape that best fit a character. If you have several great ideas, put it out on different silhouettes. Once you are done with that, then can you concentrate on the finer details of the designs based on what you have come up with for each. When you are creating a character, you must always consider to logical aspect of how it is being shown or portrayed because logic and practicality are something that everyone could relate to and understand.It basically explains why things are and how it works.You must also remember that not every design is going to work with a character’s personality or how he/she get things done.This goes from the character physical appearance, his costume/armor, all the way to how the character’s power works. Now, we are not looking at a before-and after effects just yet but more on how a character would look on a regular basis.Looking at things in a more logical way, a character’s mannerism and behavior plays a large part on how he/she looks but it influences just as much for the other parts of the character such as the costume/armor or the way the weapon works.In comics, most beginners would make the mistake of concentrating more on exaggeration and ignoring any sense of realism altogether.This can be a bad start because as mentioned before, realism and logic are something that anyone can relate to and without enough emphasis on that, you risk losing people’s interest just by the character design. Let”s take a look at the two major parts of a character design and see how a good sense of logic as well as some design flaws that can make-or-break a character design. Here, we are talking about the physical form of the character(Thin, bulky, athletic, fat, tall, short, huge). This is the most basic part of a character design and also the most important.Refer back to your character development worksheet on your character’s physical look (physique). Most would get right in and design the character with the armor or costume on, which is alright, but taking a look at a more logical side of things , always know what to prioritize first . Which is in this case, the character comes first and the armor, equipment or costume must be based on the character’s structure and form. Pretty simple isn’t it. Getting familiar with the physical shape of a character is essential mainly because it gives you the basic consistent frame or shape that you can work your armor/costume on, so that the character has the same form, even in different attires.This approach give you more versatility on your armor or costume design and give the realistic sizing and placing based on the structure of your character. P.S -The physicality of a character alone could create a strong possibility of a back-story. Therefore, you should really consider investing more time on how a character would look underneath, especially if you are looking to create a realistic character. Considered to be the best part of character design, this is where most of your design creativity is centered on – attire, armor, equipment. You can think of dozens of things to put on your character but you could also be making just as many mistakes on your character designs.Most of the flaws or mistakes made when creating armor or costume design have a lot to do with logic and practicality.It may be cool to put certain items to make your character stand out from everyone else but then you risk putting in stuff that is totally unnecessary ,which make people question the purpose of having such equipment or shapes there in the first place.You must also take into account on how the armor or costume works.The design of your armor/costume must be well placed so that it does not restrict your character’s movements (More on “form follows function” on next page). P.S – There are times when the “less is more” approach works great for some character.Simplification of the design could make a character stand out more instead of being bulked up by equipment or weapons.The “more the better” works for many other characters, especially if you are going for a strong military concept or plot in your storyline.